â&#x20AC;˘Scrap metal â&#x20AC;˘Household Appliances And much more. Easter Sunday, 16th April at 10.45 am and 6.30 pm. Flower Power Returns to Cromer for 60s Festival Thousands turned out for Cromer’s 60s Festival at the end of last month. There was a packed programme including vintage stalls on the pier and prom, dancing by Marlene’s School of Dance, live music organised by Rock the Lobster, classic vehicles including 60s scooters, motorcycles and cars and music from the era in North Lodge Park. Town centre businesses also entered into the spirit with shops decorated and staff in costume. The Beatles would have been proud! Centre in North Walsham, Fakenham Sports and Fitness Centre and Splash Leisure and Fitness Centre in Sheringham on 1 April after agreeing a 10-year contract with North Norfolk District Council. everyone active will manage six centres Six leisure facilities in North Norfolk are now officially under the management of one award-winning leisure operator. It has also taken on the out-of-school-hours operation of three dual use sports centres adjoined to local schools in Cromer, North Walsham and Stalham. people under-insure their house and its contents, so do check the level of cover. Sometimes the security arrangements are insufficient to meet the insurance company’s requirements, so do not overlook this. After 60 days most insurance companies impose conditions and restrict cover on empty properties. If this is a worry, we can undertake property checks and have useful local reliable contacts and knowledge. There are then the practical matters to deal with such as ensuring that household bills continue to be paid and that the house is kept warm enough so the pipes do not freeze and burst or other problems arise. This article aims to supply general information, but it is not intended to constitute advice. Every effort is made to ensure that the law referred to is correct at the date of publication and to avoid any statement which may mislead. However no duty of care is assumed to any person and no liability is accepted for any omission or inaccuracy. Always seek our specific advice. If you would like further advice on this matter please contact Miranda on 01328 710210. If you require advice on any other legal matter call 01263 825959 or email law@hayes-storr.com. and All Saints Community Rooms, 26 Cromer Road, Mundesley NR11 8BE open 10am -4pm. Free entry and parking. Over 40 stalls in both venues, an exciting selection of high quality crafts all handmade by our local Norfolk artisans, perfect for residents and tourists of all ages. New this year is the addition of 'Treats and Tweets' Tea Room which will be serving a delicious range of homemade hot and cold snacks throughout the day. So why not come along and see what we have on offer, you will be sure of a warm welcome. John Stainer (1840-1901) was an English composer and organist, including at St. Pauls Cathedral, London. His oratorio ‘The Crucifixion’ is amongst the most popular of all English choral works and portrays the events of Good Friday. Scored for Tenor and Bass soloists, mixed choir and organ, this meditational oratorio contains recitatives, solos, rousing choruses and congregational hymns. The centrepiece is the evocative anthem ‘God so loved the world’. The first ever performance of this work was at Marylebone Church in 1887.
would you like to learn what’s going on in and around Cromer? would you like to help your local community? With over 100 different volunteering opportunities known in the local area, the North Norfolk Volunteer Hub would like to invite you to come and find out about what you can get involved in. Volunteering can greatly benefit you as it allows you to learn new skills, help others and is an excellent addition to your CV. Above all, it is great fun and you get to meet loads of interesting people! Come along on either Tuesday 16 April, 12pm – 4pm or Wednesday 17 April, 9am – 12pm to talk to a member of our Volunteer Hub team, enjoy refreshments and discover what would be the best use of your time and interests. The last three autumns found her painting waves of colour inspired by sunlight bursting through the swathes of autumn leaves such as the ‘Victory V’ plantation of beech trees in the Great Wood at Felbrigg. This large Felbrigg ‘Victory V’ painting was chosen for a heritage exhibition at Norwich Castle last spring. The exhibition runs until April 19 at NNDC’s Holt Road offices. The First Floor Gallery is open to the public 8.30am-5pm on Mondays, Tuesdays and Thursdays; 10am-5pm on Wednesdays; and 8.30am4.30pm on Fridays. Sam and Chelsie from The Art House Café in Cromer will be taking part in two charity challenges this year. They will be taking part in the Norwich 10k Run on the 21st July and will be climbing the National Three Peaks on the 24th August (in 24 hours). It was an honour to welcome members from North Walsham and Wymondham branches, including Colin Chambers who laid our wreath and Peter How who carried our Standard at the GP90, and also a new member to our Branch, at our April Meeting. Colin and Peter gave us a tremendous insight in what it was like to take part in this commemorative event, from the time they left Norfolk, their journey, the March, the wreath laying, to be with and to see so many Royal British Legion Standards, and to feel the emotion, which was very high, was almost impossible to describe. Peter presented our Branch with a set of photographs which clearly portrayed their talk, and these will now be on our display as they now form part of the history of our Branch. Thanks to these two guys who made it possible for us to be represented. This has meant so much to our members, especially at the time when our Branch had just launched its revival, and we thank them so very much. We are very proud to have our Standard photographed with our guests. A great evening and a fine example of branches working closely together. We are honoured to be attending the North Walsham Branch Armed Forces Day on 29 June. Our next meeting will be at Northrepps Country Cottage Hotel on Monday 13 May, a week later owing to the Bank Holiday. Why not come along and join us. For further information contact Lorna on 01263 579633.
our Foster Carer ambassadors can help you step up The fact is, you don’t need a special skill set to become an exceptional foster carer. What you will need are qualities such as patience, understanding and, let’s be honest, a sense of humour. When it comes to age or status or whether you’re retired or working you could still foster. Whatever your walk of life, our team of Foster Carer Ambassadors can help you step up and lead you through the process. Our Skills to Foster training programme will provide you with all the need-to-know essentials, while your recruiting social worker will always be on hand to help, advise and offer invaluable pearls of wisdom. You should also be reminded that you have the right to withdraw your consent at any time and this should be as easy to do as giving it. Often an ‘unsubscribe’ link is provided for this purpose but beware this action will rarely delete your details from the database, to do this you must ask separately. My final message is this : before giving consent, be absolutely clear what the requester is going to do with your personal data and if you are not comfortable with it, don’t give it. Never forget, your personal data belongs to you and no one else, so be careful who you give it to. Appeal after cars damaged in Overstrand Officers are appealing for information after damage was caused to a number of cars in Overstrand last month. The incidents happened on Friday 22 March 2019 where suspect(s) have scratched three vehicles, which have been parked on the High Street. If you’d like to make a positive difference to a child’s life, as well as your own, why not find out more about becoming a foster carer today. Simply call 01603 306649 or visit the Norfolk Fostering Services Facebook page. Officers are keen to speak to anyone who may have seen any suspicious activity in the area around the date stated. 1932 Electrically lighting the putting green was agreed at a cost of £29 7s plus £15 for poles. 1934 The Council decided to retain the Rocket House site which had been offered to them, and opened to the public after development the following Easter. 1935 Repairs to the Rocket House Shelter were in progress, the top level of the site was being laid out in flower beds, alterations to the steps were being made, and final designs were approved for the tea rooms and shops at the foot of the Rocket House site. 1938 Phrenologist ‘Alexine’ looking for “sites available for his purpose” was offered a bathing hut on the Rocket House site with access from the Gangway for the season. 1960 ‘Bona fide’ OAPs were to be given free putting (and pier entrance) up to the end of May and after the second week of September. 1970 Toys and equipment selected for the new Children’s Corner included two 3-bay Children’s Swings, a special See-Saw, a number of wheeled toys, and a £10 hut to store the toys and equipment. A special treat this month – the first hand memories of Margaret Hunter, or Baker as she was when her family moved into North Lodge in the summer of 1953 where they lived until 1960.
live in the first floor flat at North Lodge when my father Billy Baker was appointed Parks Superintendent and my mother Elsie Caretaker for the Council Offices. Our flat was selfcontained with its own front door at the top of the stairs and consisted of three small bedrooms (mine overlooked the bowling green), a bay-windowed lounge facing the sea, bathroom, and kitchen looking up the drive. Father had a gang of men Arnold Ward, Lenny Griffin, Edgar Savoury, Michael White, and Bob Cox who cared for the Norwich Road Grass Courts. Extra staff were taken on in the summer for the putting green kiosks, originally in the little single storey extension to the side of North Lodge and a second one on the distant, over the bridge, course. The ground staff’s domain was the basement, which would have been the domestic offices when the Hoare family lived there. I remember a row of servant call bells hanging on the wall. The area between the 9-hole course in front of North Lodge and the tennis courts was a roughly grassed area with open-air Shakespeare performances in the 1950s, when I also remember the Dagenham Girl Pipers and other Scottish marching bands performing on the hard courts. model yacht pond was built had a bandstand. Every Sunday afternoon in the summer a local band entertained. When the new boating lake was built a new bandstand was built on the Hard Tennis Courts, providing a large audience arena and again chairs were put out and taken down for events. I remember waking up one morning in my bedroom overlooking the bowling green as chaos reigned below. A herd of bullocks had escaped from Bird’s Meadow (today’s Meadow car park/ Information Office) and went along Louden Road-Mount Street-Gangway into North Lodge Park and got onto the bowling green. Suffice to say there was quite a bit of surface damage. The last duty of the day for Father was to lock all the gates at sundown. As a young girl going off to Guides I had a gate key in my pocket! The Red Hart A proper pub! At the March meeting of the Cromer & District Branch of the Royal British Legion, their Branch Standard was formerly handed to their new Standard Bearer, Bethan Phillip-Pritchard. Conducting the ceremony in front of members and a County representative was the Branch Chairman, Hilary Cox MBE. at Aylsham. Part of her duties also includes attending the funerals of members of the Legion or the Armed Forces. symbolic of our unity and our loyalty to the crown, community and nation. The royal blue signifies fidelity, and the gold band recalls all those who have died in the service of our country”. Bethan said “It has been such a marvellous honour to be formerly recognised as the Branch Standard Bearer. I am so grateful to everyone who has helped me with my training, in order to achieve the required benchmark”. In September, 19 year old Bethan said that she will be moving to read Law at University but will return to Cromer to continue her duties as Standard Bearer. The Branch Chairman said “I exhort you to remember always that this Standard is a sacred emblem, and it is now placed in your charge to be cared for in the name of The Royal British Legion”. Since becoming the Branch Standard Bearer her first duty was to take the Standard to have the ‘Ypres 2018’ scroll added. This was awarded to branches among the 1200 who attended the event in Ypres, Belgium in August last year. Late on Saturday 29 March Cromer’s all weather lifeboat ‘Lester’ was launched to a report of the Isla B’s steering failed. The ‘Isla B’ guards fishing areas but the ship was a lot more weighty because of the gear they had on there. The crew of the offshore lifeboat, Lester, was launched at around 9.45pm and initially asked to assist the ex-trawler into harbour at Great Yarmouth. Later Mr Leeds said the Cromer crew were finished by 2am (Daylight Savings Time). All our vehicles are sold with full 12 months MOT, 3 months warranty, serviced & valeted. At Williams all of our work is carried out at our West Runton premises as it has been for the last 30 years, no middlemen means greater value for money. Whether its a spring repair, new seat foams or a complete lounge suite with co-ordinating curtains you can be guaranteed of first class customer service and attention to detail. In our showroom we have pattern books from Parkertex, Linwood, Crowson etc and we are proud to be Sandersons fabric and wallpaper specialists . We now stock a range of home accessories including a large selection of Dora Designs doorstops and draught excluders. We provide Social Care Day Facilities for ex-service personnel & their dependants. If you are feeling lonely & would enjoy some company & social stimulation in a warm, friendly environment, or need a break from caring for a loved one, then our team of friendly staff are here for you. Day Care runs Monday – Friday 9.30am – 3.00pm (transport provided within a 6 mile radius). Day Care for those living with dementia offers stimulation & company in a smaller & secure environment & runs on Mondays, Wednesdays and Fridays 9.30am – 3.00pm. For more information please call: Julie Fields, Head of day Care, on 01263 517938. The time of year has come upon us. The time for spring flowers. FOUR letters or more. There are fifteen â&#x20AC;&#x2DC;spring flowersâ&#x20AC;&#x2122; in this issueâ&#x20AC;&#x2122;s CHRONICLE WORDSEARCH. How many can you find? Using all FIVE arithmetical signs, + + - x Ăˇ, fill in the spaces to make the equation true, as if they were being entered into a calculator. For our March meeting we were fortunate to have a local historian , ex head teacher of the well renowned Belfry School in Overstrand, Tim Bennett who gave an illustrated talk about Gervase Phinn, author and schools inspector ,and now something of a showman. As our speaker read well-chosen extracts from some of Phinn’s books, an audience of sober WI ladies was almost beside themselves in helpless laughter. Gervase Phinn a Yorkshireman, took his inspiration from the settings and colourful characters who populated it. His book titles often mirrored the locations, such as ‘The Other Side of the Dale’. His text was wonderfully descriptive, immersing us in its humour. One example featured a young pupil who repeatedly said that a relative of his had ‘65 roses’. Uncomprehending initially, Mr Phinn realized what the lad was conveying, was in fact cystic fibrosis – rather less pleasant than aromatic flowers. The Cromer Academy pupils filled dozens of black bags with litter as they blitzed the town’s beaches, streets, pier, and promenade on Friday 29 March, with year groups heading out in shifts to tackle a particular area. Amongst the plastic bottles, drinks cans, and crisp packets, they collected some more unusual litter including a frying pan and plastic cutlery tray. The following business seemed rather pale in comparison, but amongst other things , an invitation for four of our members had been received from a lady soon to be holidaying locally, for afternoon tea and cakes – right up our street! Possible activities for Norfolk Day 27 July and a wellbeing meeting in August were discussed. The rubbish was taken back to the school where it will be collected by North Norfolk District Council for sorting and disposal. Headteacher Antony Little said "Caring for our environment is especially close to our hearts at Cromer Academy, as a coastal school. We all have a duty to keep our town clean and tidy, particularly given the impact of plastics on marine life. We had over 570 students out and about, in our town and all along the coastline, cleaning up and collecting litter. I am incredibly proud of them and the positive impact they've made in our community." sPeCial eVent african Drumming Dance and stories with Millicent Chapanda on Wednesday 17 April 2pm - 3pm - a fun workshop for everyone. ÂŁ3 per person. Booking essential. Please contact Cromer Library to book a place. Drawn together - a series of 6 creative workshops run by local artist Kirsty Oâ&#x20AC;&#x2122;Leary-Leeson starting Thursday 25 April 2.30pm - 4.30pm - sessions are suitable for all ages and abilities. Refreshments provided. Free event but donations welcome. Mardle in the library Tuesday 14 May 10.30 - 12pm â&#x20AC;&#x201C; a talk run by local historian Tony Rogers. More details to follow. Drop in event. everyday wellbeing in later life workshop Wednesday 1 May 10am - 12pm - for those in or approaching later life. The workshop will introduce you to tried and tested techniques to help you live your life to the full and provide further information and support should you need it. A free event. Contact Cromer Library to book your place â&#x20AC;&#x2DC;Dna Detectives â&#x20AC;&#x201C; to Catch a thiefâ&#x20AC;&#x2122; on Saturday 22nd June 2pm - a chance to learn about DNA cells and forensic science. A â&#x20AC;&#x2DC;hands-onâ&#x20AC;&#x2122; interactive workshop aimed at inspiring children to have a love of science and literacy. Limited spaces. Please contact the library to book a place. ÂŁ3 per child. sleep workshop - are you and your children struggling to get a good nightâ&#x20AC;&#x2122;s sleep? On Friday 28 June 11.45 am (this is the 2nd clinic. The first clinic is to be held at Suffield Park Infant School on 22 May 10am â&#x20AC;&#x201C; 12.30pm) The sleep workshop is suitable for parents who have attended the first clinic. For information and to book a place please contact joybishop@sleepeast.co.uk. Just a Cuppa each Monday and Friday at 2pm - fancy a chat? Come along to â&#x20AC;&#x2DC;Just a Cuppaâ&#x20AC;&#x2122; and see who else is about. Our friendly volunteers will be delighted to see you. Free refreshments. share Your skills â&#x20AC;&#x201C; a new group that will be meeting on the first Friday of each month 11am to 1pm next date Friday 5th April - come along and meet some new people, have a drink and a chat while you try something new or pass on skills you have to other members of the group. bounce and rhyme next date 26 April Friday 11am â&#x20AC;&#x201C; 11.45am - please come along and join Chrystal for songs, rhymes and stories. These sessions are suitable for pre-school children and will be held on the second and fourth Friday of each month. seated exercise Thursday 10.45 â&#x20AC;&#x201C; 11.30am - sessions in conjunction with North Norfolk District Council. Contact 01263 516305, wyn.nurse@northnorfolk.gov.uk. north norfolk association for the blind Monday 6 May from 10.30am to 1pm â&#x20AC;&#x201C; a signposting session. No booking required. Knit and natter Friday on 17 May 10.30am â&#x20AC;&#x201C; 12noon - do you enjoy knitting? Norfolk Knitters knit for charity. Items are sent to those in need in this country and other countries - all materials are supplied. Cromer Library is a collection point for the Sheringham Community Wool Loft. They are pleased to receive any knitting related items. Cromer Carerâ&#x20AC;&#x2122;s Cafe first Thursday on alternate months 1pm â&#x20AC;&#x201C; 3pm do you look after a relative, friend or neighbour who is ill, disabled, has a mental health problem or learning difficulty? If the answer is yes, then you are a carer. Relax, meet new people, enjoy activities and guest speakers. Next meeting at the Library Thursday 2 May. No booking required. art and Craft group Mondays 10.30 -12.30 - come along and meet new people. Spend a relaxing morning being creative Bring along your own project or use the materials provided. No experience necessary. Poetry group meets last Thursday in the month at 2.30pm - come along and enjoy discussing poetry with other like-minded people. Home Delivery service If you love reading or listening to books but find it difficult to get to the library, we have volunteers from the Royal Voluntary Service who can deliver books to your door once a month. The Home Library Service is for people who are unable to get out of the home whether permanently or temporarily. regular eVents Coffee, tea, Chocolate and biscuits available for ÂŁ1. Come in and read the newspaper, we have the EDP, The Times & North Norfolk News. borrow Magazines. we also have a large selection to download. Use our free WiFi and public PCs. Get all the latest news and â&#x20AC;&#x2DC;likeâ&#x20AC;&#x2122; us on facebook: Cromer Library Follow us on Twitter @CromerLibrary 2 for 1 offer on DVDs and music CDs every Monday and Friday. all DVDs cost ÂŁ2.00 to borrow. Open Library (unstaffed) Staffed Hours Mon, Tues, Thurs, Fri 8am-10.30am 10.30am-7pm Wednesday 8am-7pm unstaffed Saturday 8am-12pm 12pm-4pm Sunday 10am-4pm unstaffed During an Open library session you can borrow stock, use Computers, Wi-Fi, photocopier and print. Please note, you will be unable to borrow DVDs and Music CDs. DON’T FORGET TO MENTION THE CROMER TIMES WHEN RESPONDING TO SERVICE GUIDE ADVERTS! Problems with steamed up double glazing? Mr & Mrs S Looking for a minimum 4 bedroom detached house – ideal family home, up to £350,000 in Cromer only. Owner currently Sold STC. Can you help? Mrs D Local single lady looking to downsize seeks 2/3 bedroom house in Cromer up to £250,000 - does not mind terrace/semi/detached some works undertaken. Can you help? couples and their guests that we are working very closely with the conservation company and the scaffolders to ensure that there is minimal impact on ceremonies. CoMMunitY oPen DaY The date and location for the Community Open Day is being reviewed. Please keep and eye on our social media pages and notice boards for updates. Any organisations wishing to participate in the event are asked to contact the Town Clerk to register their interest. Contacts: Julie Chance PSLCC, Town Clerk clerk@cromer-tc.gov.uk Janet Warner PSLCC, Deputy Clerk deputy@cromer-tc.gov.uk The Clerk and Deputy Clerk are often in meetings so it is recommended that you telephone or email to make an appointment before visiting the offices. CroMer CHristMas Celebrations The Christmas Lights team are looking for a Christmas tree for this yearâ&#x20AC;&#x2122;s event. If you have a suitable tree (approx. 25â&#x20AC;&#x2122; high) in your garden which you would like to donate please get in touch. Please could all traders and charities wishing to participate in the Christmas Market on 30 November 2019 contact the Town Clerk for an application form. town Council and Committee Meetings: The full schedule of meeting dates for 2019 can be found on the Town Council website and noticeboards. A leaflet containing the schedule of meetings is available from the Town Council Office. Members of the public are welcome at all meetings, which are held at North Lodge unless stated otherwise. Agendas and minutes of meetings are available from the Town Council website. information on any meetings or matters arising can be obtained from the town Clerk on 01263 512254.
town Crier We are still searching for a Town Crier to replace Jason Bell who is retiring after 35 years. Please contact us for an application form. CereMonies at nortH loDge We are currently receiving lots of booking for ceremonies for 2019 & 2020. Ceremonies can be held in our newly decorated chamber or in the clifftop garden. Further information can be found on the Town Council website and our facebook page @WeddingsinCromer. We can also host Renewal of Vows and Naming Ceremonies. If you would like to visit our venue please give us a call to arrange an appointment. 18 March - 23 April On 18 March, along with other Norfolk Libraries, Mundesley Library launched The Great Big Read, Norfolkâ&#x20AC;&#x2122;s annual reading promotion which will be promoting the World Book Night booklist of 23 titles which includes crime thrillers, film tie-ins, some of the best new novels written for young people and even a book set in Norfolk by the popular crime writer Elly Griffiths. World Book Night is a national celebration of reading & books on 23 April every year with events to celebrate the difference that reading makes to peopleâ&#x20AC;&#x2122;s lives. Readers can add a review or star rating by logging into their online library account after they have read a book and can also comment, share a selfie with their favourite read or recommend a book on the Norfolk Libraries Facebook & Twitter accounts. This weekend, Saturday 13 and Sunday 14 April, we are opening for member registration at 10am. Hopefully the green will be open for a roll-up! club competitions. What a bargain! The short mat season is over and final results for the league and cup should be available in the next issue. Currently Bob A leads with 89 points followed by James on 72 and Roger P with 63. Into the semi finals are Hazel P and Bob A.
members volunteered to paint the clubhouse, so many thanks are due to David M, Bob K, James and Neil P for their sterling work. Neil C, Bob A, Phil T, James and Jackie continue their great work on preparing the green. The quiz final may now take place on Thursday 18 April. Twelve members are in contention for the six final places! Details of fixtures, results, history, honours, and club news/photos can be accessed at cromermarramsbowlsclub.com or more details from Edna 01263 511155.
club friendlies, in house competitions and teams in local charity league. Non members, new or experienced bowlers warmly welcomed. Come and enjoy fresh air, gentle exercise and sociable company. For more information contact Ray on 01263 511545. The first of a series of Weekend Walks, organised and led by Walk Cromer, took place on Saturday 23 March. The walk, from Cromer pier to Overstrand and back, was blessed with ideal walking weather and the views from the lighthouse back to Cromer and onto Overstrand were spectacular. lookout station, Cromer lighthouse, the Royal Cromer Golf Club, Geology and coastal erosion, Overstrand village and North Lodge Park. at a café for a break and refreshment. Numbers are limited, so please arrive 10 minutes early to sign in. Walks are free, but we welcome donations to our chosen charity the British Heart Foundation. mainly flat walk on minor roads, field edges and grass/dirt tracks. Meet at the Gresham Village Hall CP, East Beckham Lane, Gresham, NR11 8RT. Friday 26 April – 11am - Northrepps Hungry Hill Walk – Grade 3 – Approx. 2.75 miles – A walk with gentle gradients along minor roads, tracks and woodland paths. Meet at the Foundry Arms CP, Church Street, Northrepps, NR27 0AA. Win with the Cromer Times & Mackenzie Hotels 2 main courses from their ‘2 for menu’ and a hot drink of your choice for 2 Re-arrange these letters .... SPLASH OR WEIR. Clue - Still get wet .... (2 words)? The first correct answer drawn at random by the Links will win lunch for two at any of the three Mackenzie Hotels. Rules - Free to enter. One entry only per household, entrants must be over 18. 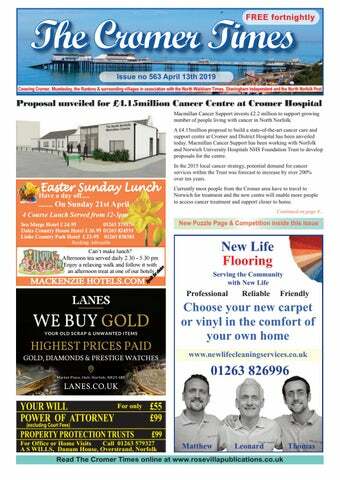 The winner will be published in the next available Cromer Times after the draw. No cash alternative. Mackenzie’s decision is final. Your local award winning Leng Agent! Mundesley £795 pcm A well presented detached house situation in a quiet location close to the village centre. Comprising Lounge/Diner, Kitchen, Three Bedrooms, Bathroom & Downstairs Cloakroom, Enclosed Rear Garden, Garage & Parking. EPC TBC. Cromer £795 pcm A well presented semi-detached house situated close to the schools & comprising Lounge, Dining Room, Kitchen, 3 Bedrooms, Bathroom, Front & Rear Garden. Unfurnished & Available End of April. EPC C71. Cromer £550 pcm Situated right in the centre of the town, this ground floor studio flat comprises of Kitchenette, Lounge/Bedroom, Bathroom, Double Glazed & Electric Heating! Would suit retired/working applicant. Available NOW. EPC C71. Mundesley £625 pcm A well presented 2 bedroom first floor flat with private entrance & stunning sea views. Situated in a popular location only a stones thrown away from the sea front & only a short walk away amenities. Part Furnished & Available NOW. EPC D61. North Walsham £575 pcm Two bedroom mid terraced house situated in a popular residential area of North Walsham. Comprising Lounge, Kitchen, Two Bedrooms, Bathroom, Garden, Allocated Parking for 2 cars. Available Unfurnished NOW. EPC C73.